Quinn may soon have to give up his Mercedes Benz in favor of a Ford Taurus. If he doesn’t get cast in a big role soon, Quinn may have to forget his dream of being a successful actor and take a job at his Uncle’s Real Estate firm – where he’ll make tons of money but remain creatively unfulfilled. What a tragedy. Finally, Quinn is worried that his uptight and withholding younger girlfriend Kelly (Emmanuelle Chriqui) is cheating on him with his friend/rival actor/notable tool Riley (Eric Christian Olsen). One day, Quinn is auditioning for the role of a lifetime: The starring role in a fantasy-biopic about a young Harry Truman who fights werewolves. Quinn nails the audition and finally feels like his luck is turning around. On the car ride home he gets a call from the Casting Director: Quinn was incredible, but he’s too old for the part… Quinn is devastated. Quinn arrives home, ready to be comforted by Kelly. He walks in and hears a noise from the upstairs bedroom of the gigantic beachfront apartment that they somehow can afford. Quinn opens the door and sees Kelly banging Riley. Yup, she was cheating. Quinn packs up his stuff and gets ready to leave. Before he walks out the door, he hands a magnifying glass to the apologetic Kelly. Quinn’s parents Jebediah (John Lithgow) and Hannah (Blythe Danner) are the exact opposite of Quinn in every way. Jebediah and Hannah are a couple of free spirits who flit from one impulsive adventure to the next, which is great for two people, but not so great for their uptight son. Quinn basically had to raise himself – a fact that has filled him with a life-long resentment for his parents, who’s constant attempts to get Quinn to loosen up and live his life have fallen on deaf ears for 40 years. When Quinn arrives home, all the resentment comes spilling out in an emotionally-charged argument that causes both sides to speak some harsh truths. After the argument, Jebediah and Hannah tell Quinn they’re going snowmobiling for a week and they need Quinn to look after the place. On their way out the door, they tell Quinn that they got him a surprise – he should expect it to be delivered the next day. The next morning, Quinn gets a phone call. It’s the police. They tell Quinn that his parents died in a tragic snowmobiling accident while trying to recreate the Titanic deck scene on a snowmobile going 40mph. As a devastated Quinn tries to process this information, the doorbell rings. Quinn opens the door and sees: AN ALLIGATOR. It turns out, in their final act of parenting, Quinn’s parents adopted an alligator and assigned its custody to Quinn. In other words, Quinn now owns a f*cking alligator. 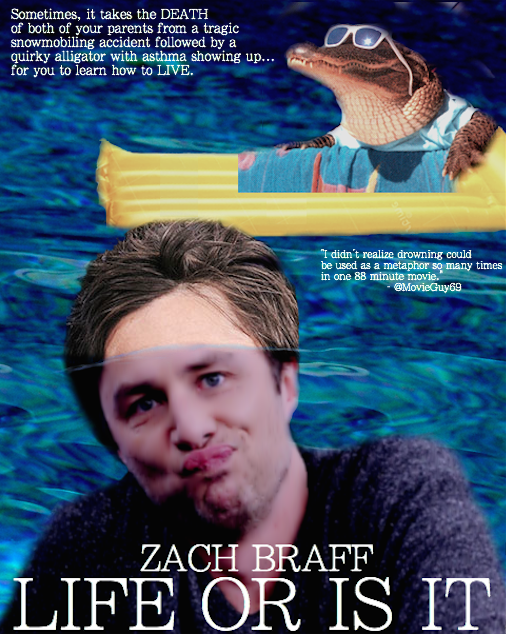 And so, the cynical depressed Quinn must come to terms with his parents’ death and learn to take care of this alligator (named Daniel) while discovering the truth about what makes life worth living. On his journey, Quinn will enlist the help of Morgan – who coincidentally grew up on an alligator farm and has a special bond with the animals – to take care of this creature, who’s outer shell is so thick, but who hides a warm mushy heart on the inside. Filled with approximately nine life-affirming moments, all occurring in the middle of dramatic rain storms, “Life Or Is It” is an emotional journey that will have you re-evaluating what really matters. Lessons and metaphors about family, love, nostalgia, work, animals, water, adolescence, adulthood, childhood, television, pop culture, and dysfunction pour from ever frame of this movie. “Life Or Is It” is a movie that will have you screaming for joy into the side of a mountain and then have you jumping into a pool with all of your clothes on! Because it’s more emotional that way!